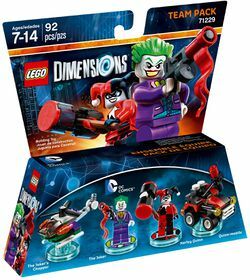 71229 DC Comics Team Pack is a Dimensions set released on January 19, 2016. The set contains The Joker and Harley Quinn minifigures, The Joker's Chopper, and the Quinn-mobile. This is a description taken from LEGO.com. Please do not modify it. (visit this item's product page) Get devious with DC Comics’ The Joker™ & Harley Quinn™! Place the mischievous DC Comics™ villains The Joker™ & Harley Quinn™ on the LEGO® Toy Pad to launch them into the LEGO DIMENSIONS™ multiverse. Use their weapons and activate their powerful special abilities to battle enemies and solve exciting puzzles. When things get tough, send in The Joker’s Chopper and Harley’s Quinn-mobile. Then rebuild the Chopper into the Mischievous Missile Blaster and The Joker’s Lock ‘n Laser Jet, and transform the Quinn-mobile into the Quinn Ultra Racer and Missile Launcher for upgraded abilities in the game. Activate TheJoker’s special Grappler, Target, Hazard and Electricity abilities, and Harley Quinn’s Acrobat and Super Strength abilities to solve puzzles and battle enemies. LEGO® DIMENSIONS™ Starter Pack and internet connection requir ed. Facts about "71229 DC Comics Team Pack"
This page was last edited on 28 August 2016, at 09:34.